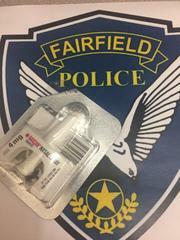 Monday night, January 14, just before 11:00 pm, Fairfield Police Officers responded to a medical aid call in the 300 Block of Travis Blvd for a 50 year old male who had possibly overdosed on heroin. Officer Rick Mroz arrived on scene and located the victim in the driveway of a residence. The victim was unconscious and not breathing. Officer Mroz administered a dose of Narcan, a drug that reverses the effects of opioids, and then began CPR. Moments later, Officer David Nevins arrived and administered a second dose of Narcan. The officers continued CPR until paramedics arrived and transported the victim to the hospital. The victim was revived and received further treatment at the hospital. All Fairfield Police Officers were issued Narcan in early 2018 and received training from the Fairfield Fire Department in its use. Narcan is a critical tool for reversing opioid overdoses. Fairfield is not immune to the current opioid crisis our country is facing and our first responders are prepared to act when needed.